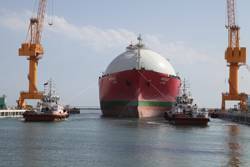 One of the biggest and most modern ship repair yards in the Middle East, Oman Drydock Company (ODC), has recently received its first LNG carrier, the Muscat LNG, owned by Oman Shipping Corporation SAOC. As part of its middle term service, Muscat LNG underwent the service operation at ODC during 11 days and was delivered within the estimated 12 days. The service operation for Muscat LNG included the mechanical cleaning of the main boilers and the fire sides. She was pressure tested and the LNG Cargo pumps, the ballast pumps and the safety and mounting valves for the main boiler were overhauled. The cable hangers and cables were renewed on flying passage (at 5 locations) and new cable supports (20 sets) for the cable way were installed during passage and the core wires were modified in tube type fluorescent light. As part of the regular maintenance work, the hull was equally painted. After the successful repair at ODC, the ship loaded LNG at Qalhat Terminal and left for the Far East. Since its soft launch in April 2011, ODC has been moving prudently towards a gradual ramp-up of its operations. Starting with handling of relatively small vessels, ODC has since then handled a total of 32 ships of varying sizes, the largest being the Hermann Buss, a 1,608 TEU vessel owned by German Shipping Line. With currently six ships under repair and four on the waiting list, ODC is all set for its commercial launch in February 2012.